"Kuwait's generosity in supporting humanitarian and development work dazzling the world"
KUWAIT-- World Bank Chief Executive Officer Kristilina Georgieva announced on Friday an exceptional award handed to His Highness the Amir Sheikh Sabah Al-Ahmad Al-Jaber Al-Sabah in recognition of his support of economic and social development worldwide, and global peace. This came at a press conference announcing the award in Washington D.C., attended representative of His Highness the Amir, Finance Minister Dr. Nayef Al-Hajraf. This is another recognition by an international organization to His Highness the Amir's endeavors to helping people and countries in need. the UN named His Highness the Amir a "Humanitarian Leader" in September 2014. 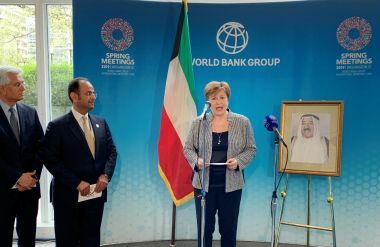 Georgieva revealed World Bank Vice President for the Middle East and North Africa Ferid Belhaj would be visiting Kuwait on April 28-30 to present an official commemoration to His Highness the Amir in person. It comes in appreciation for His Highness the Amir's globally-recognised role in supporting political, economic and social stability in addition to his tireless efforts in assisting people in need around the world. His Highness the Crown Prince Sheikh Nawaf Al-Ahmad Al-Jaber Al-Sabah congratulated His Highness the Amir for the award. The World Bank honoring deservedly crowned the march of giving and humanitarian efforts of His Highness the Amir and the generous people of Kuwait across the Arab and Muslim nations and worldwide, His Highness the Crown Prince wrote in a cable to His Highness the Amir. The world's most prestigious organizations recognized His Highness the Amir as an icon of peace and humanitarian action, he said. His Highness the Crown Prince expressed pride in the leadership of His Highness the Amir who affirmed the eminent status of the State of Kuwait at the international level. Minister of Amiri Diwan Sheikh Ali Jarrah Al-Sabah expressed, on behalf of His Highness the Amir, gratitude for the World Bank for offering this special award in recognition of his support to social and economic development in the Arab region and beyond. The World Bank honoring reaffirms the eminent status of His Highness the Amir and the State of Kuwait in the eyes of the international community and comes in recognition of relentless efforts to foster humanitarian causes at the regional and international levels, the minister said. He cited the numerous humanitarian initiatives launched by His Highness the Amir to alleviate the suffering of needy people in crisis-hit areas. His Highness the Amir is deeply grateful for the World Bank Group's kind and unprecedented award, and is looking forward to the visit of Belhaj to Kuwait later this month to present the official commemoration, the minister added. Parliament Speaker Marzouq Al-Ghanim said the award "is yet another international recognition of His Highness the Amir's humanitarian work." He said His Highness the Amir dealt with politics as a mean of helping others, and boosting cooperation and transparency. His Highness the Amir has been focusing on "the human being and his suffering ... and the humanitarian intervention policy in addition to development policies for many developing countries ... which have been highly recognized by international institutions," said Al-Ghanim. Al-Hajraf said during the ceremony the award was a recognition of His Highness the Amir's regional and global efforts to support peace, development and humanitarian assistance. Under His Highness the Amir's wise leadership, he said, Kuwait has the diplomatic ability to lead the march in support of peace and humanitarian and development initiatives in the region. The status of Kuwait today is amongst the ranks of advanced nations in the field of development-related work. Speaking to KUNA after the ceremony, Al-Hajraf said the award "shows how this leader and historic man being highly appreciated by the international institutions. "We and the World Bank Group are sending a message of appreciation for the great role of His Highness the Amir which has contributed to this well deserved recognition ... and for his relentless faithful endeavors to promote peace, support sustainable development at the social and economic levels, as well as helping countries in need around the globe," he said. Deputy Prime Minister and Minister of State for Cabinet Affairs Anas Al-Saleh said the honoring was a "a genuine recognition added to his UN's status as humanitarian leader." Al-Saleh said initiatives of His Highness the Amir to support peace and development at regional and international levels placed Kuwait at fore of countries in fighting poverty as well as philanthropy. His Highness the Amir "enforces the principle of humanitarian diplomacy, which champions peoples and countries in need," he said. Georgeiva also commended the partnership between Kuwait and the World Bank. She praised Kuwait Fund for Arab Economic Development's role in supporting development in developing countries, and said Kuwait's hosting of the February 2018 international conference for the reconstruction of Iraq reflected the Gulf country's development, peace and humanitarian role. World Bank's Belhaj thanked Kuwait and its leadership for supporting sustainable development and elimination of poverty worldwide. Belhaj also commended Kuwait's contributions to regional and international institutions, including the International Development Association (IDA), which is a World Bank Group key body. The IDA is tasked with offering loans and aid to support development in countries across the globe. Kuwait Ambassador to the US Sheikh Salem Al-Sabah, in a statement to KUNA, congratulated His Highness the Amir for his unprecedented award by the World Bank, the second international institution to honor His Highness the Amir in five years. His Highness the Amir "plays a great role in the humanitarian and development work. We in Kuwait know that very well, but now is is global, that is why this day should be a source of pride for people of Kuwait," said Sheikh Salem. Mirza Hassan, World Bank's Executive Director and Dead of Board of Executive Directors, said "We are very proud of this well deserved honoring of His Highness the Amir." 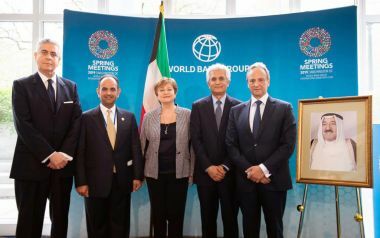 Mirza, a Kuwaiti himself, commended Kuwait's contribution to development ever since it joined the World Bank in 1962 and establishment of KFAED a year earlier. Governor of Central Bank of Kuwait Dr. Mohammad Al-Hashel the award was a reflection of His Highness the Amir's instructions to help the needy and spread peace around the world. Director of Kuwait Cultural Bureau in Washington Dr. Aseel Al-Awadhi congratulated His Highness the Amir who she considered a "role model."